We’ve been on a serious corn kick lately. Summer corn is just so irresistible. Sweet, fresh, and crunchy—I want it on everything. This is our summer take on a winter favorite, leek and butternut squash risotto. I’ve swapped the butternut squash for corn and topped it with a fresh tomato ‘salsa’ to give it the extra acidy I crave in warmer months. 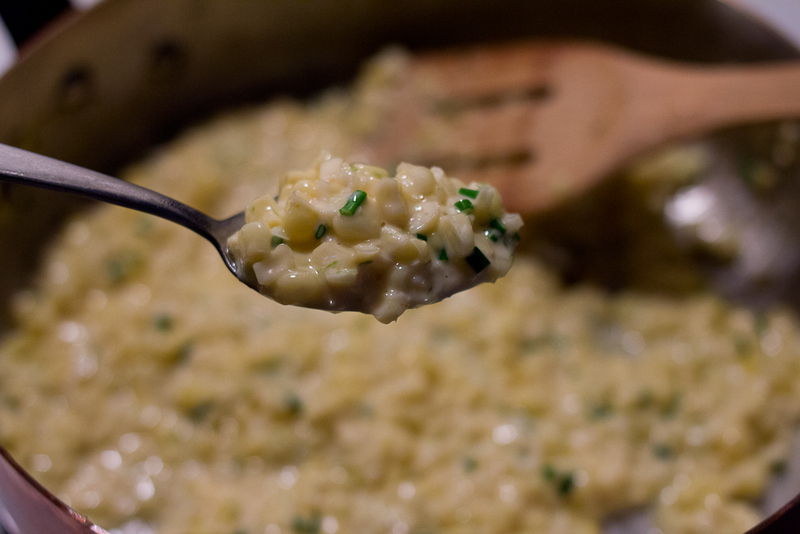 It was so easy to build off of this risotto base—it’s impossible to go wrong with rice, white wine, cream and parmesan—and this variation turned out beautifully. I’m brainstorming combinations for each season so stay tuned. In a medium saucepan, bring the stock to a simmer. In a large, heavy bottomed pot, heat the butter and olive oil over medium heat. Saute the onion until translucent, about 10 minutes. 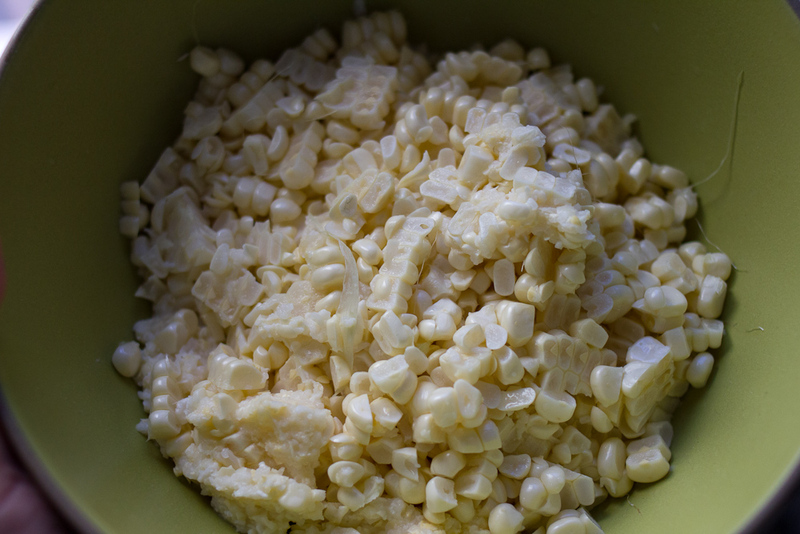 Add the rice and stir until the outside of the kernels becomes translucent and a few are starting to brown, but the inside is still white. Add the wine and simmer until absorbed, stirring constantly. Add the stock, 1/2 cupful at a time, stirring until it is absorbed. Continue to add stock by the 1/2 cupful until the rice is tender and the mixture has thickened, stirring frequently with each addition. 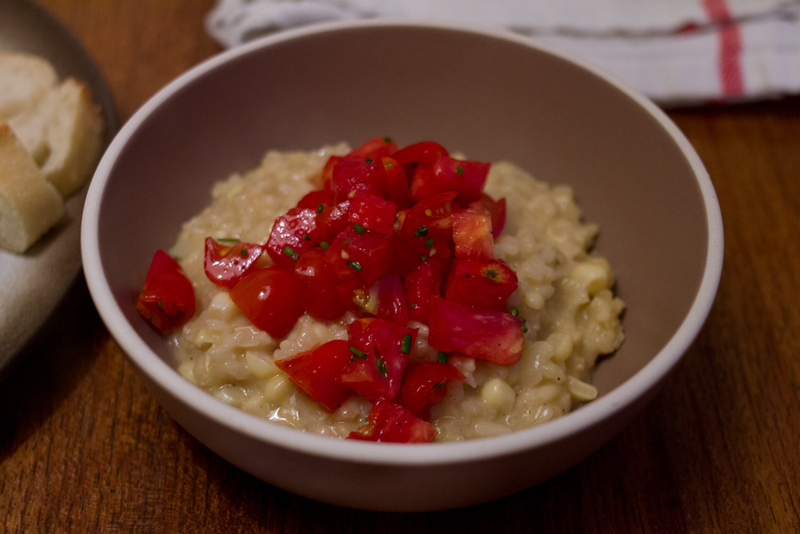 While your risotto is cooking, chop the tomatoes into small chunks and mix with the minced chives. Add a little sprinkle of salt. 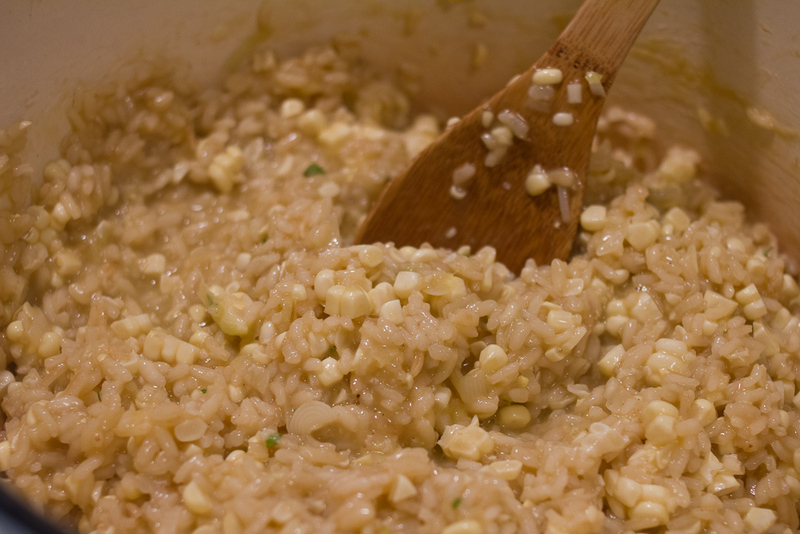 Once you’ve incorporated all the broth and the rice tender, add the corn, cream and parmesan. Cook for a few more minutes to cooke the corn. Season with salt and pepper. 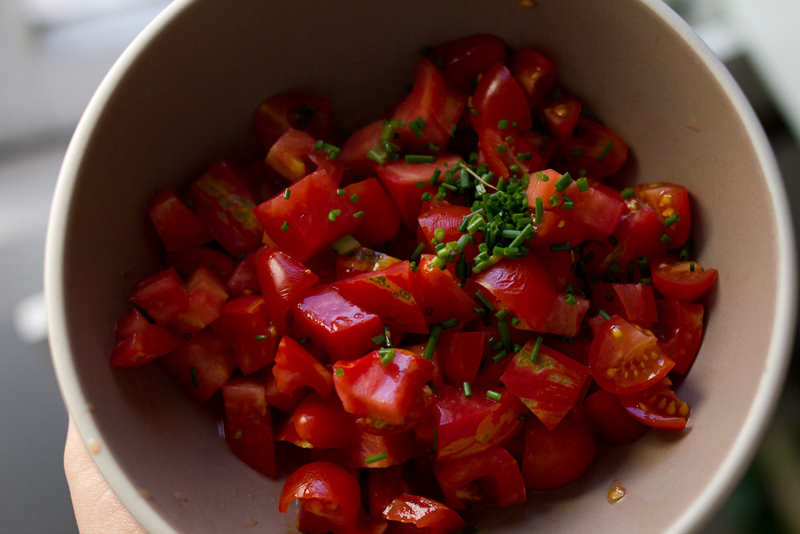 Serve warm with a spoonful of the tomato salsa on the top! Last week I was lucky to attend an awesome blogging conference Alt Design Summit. It was fun and inspiring and I’m buried under a mountain of insanely cute business cards from all of my new bloggy friends. 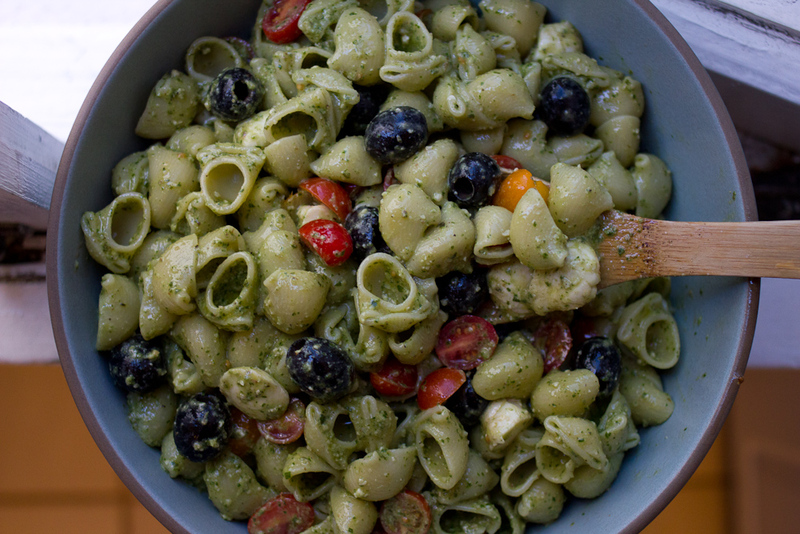 I’ll share more soon, but since I know you’re hungry, here is a recipe for a quick, easy and delicious pesto pasta salad. Pesto pasta is an old standby here. I make it about every other week in the summer when basil is in season and readily available. We usually have it for lunch over the course of a few days. It is fresh, flavorful and cheap. Plus you can through a little of whatever you’ve got lying around in it and it still turns out pretty good. 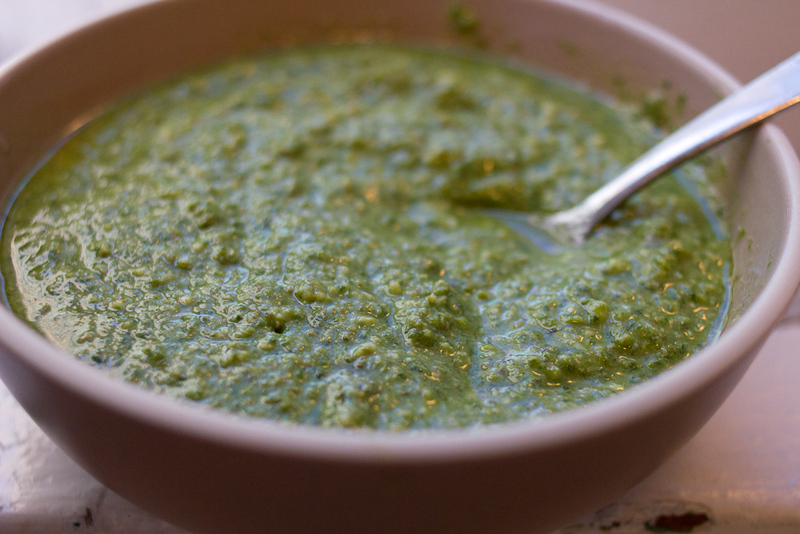 I guess pesto just works miracles like that. 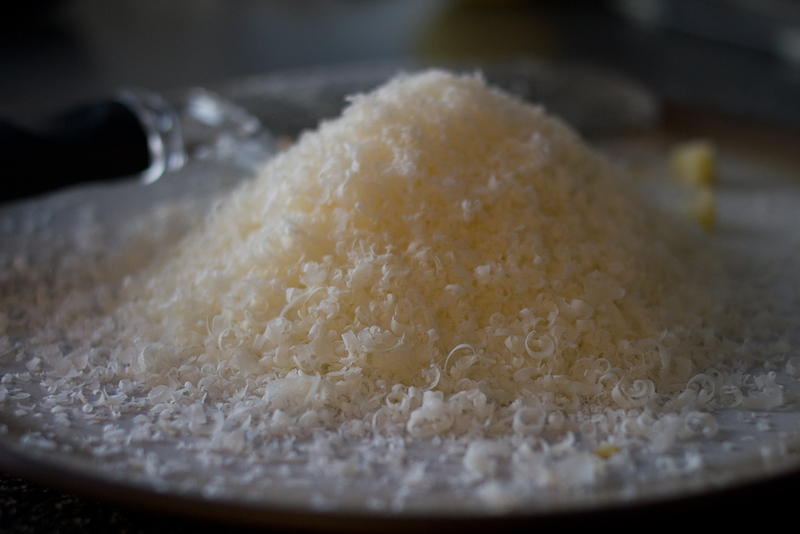 In the bowl of a food processor combine basil, lemon zest, lemon juice, garlic nuts and parmesan. Pulse until you’ve got a coarse paste. Now turn the food processor on and drizzle olive oil in through the top hole until the pesto comes together and everything is chopped uniformly. Season with salt and pepper. Bring a pot of water to boil. Salt it until it tastes like sea water. Cook the pasta according to the package directions. Drain and rinse for a minute or two with cold water. 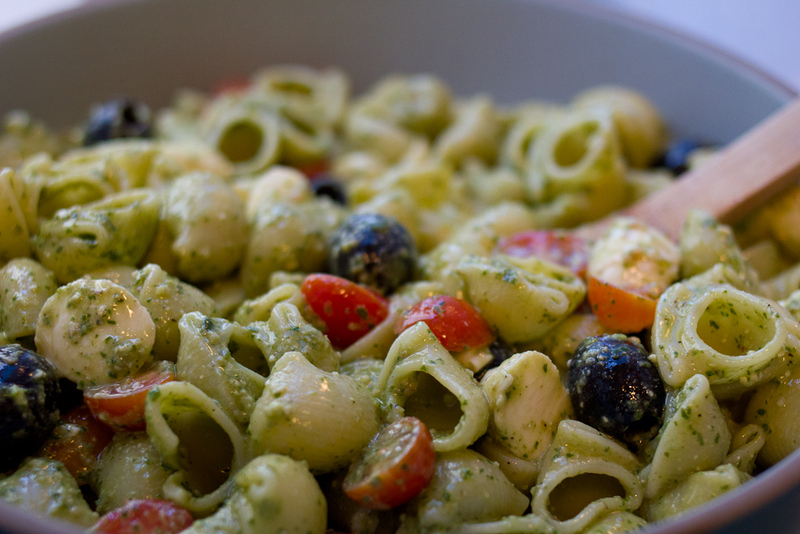 Combine pasta, olives, mozzarella, tomatoes and pesto in a large bowl. Stir to combine. Serve at room temperature or cold. 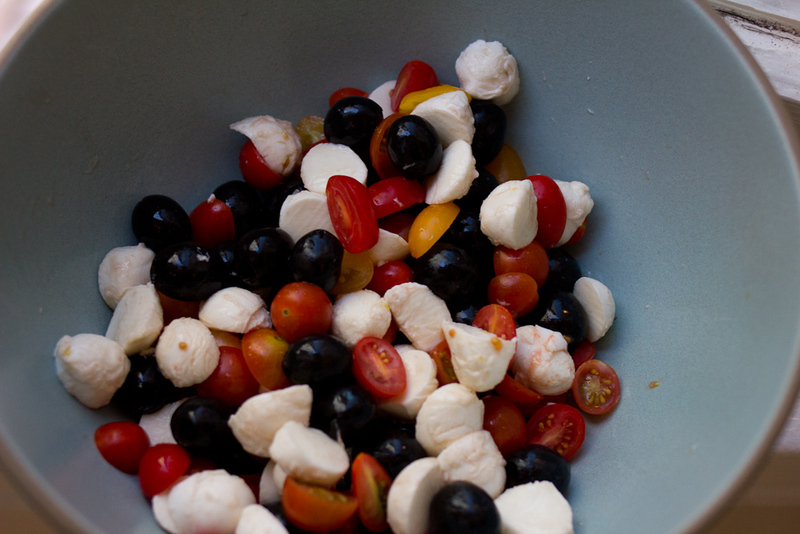 This pasta salad recipe is super flexible. You can add more veggies—blanched green beans are great, kidney beans or chick peas are a good way to make it heartier, marinated artichokes would be lovely too! Just remember that more sauce is better when you’re making a pasta that you’ll refrigerate and eat over a few days. Without enough sauce, the pasta will seem dry, bland and rather sad. I’m the type who likes projects. While I enjoy cooking dinner each night for my little family and our friends, what really gets me excited is a new project. I like the research phase at the start of a project and the challenge of stepping up my game and out of my comfort zone. And I love the satisfaction of making something I’ve never made before, especially if it turns out right. I also love losing myself in a project, letting my worries slip away for a few hours and focusing in on the task at hand. It’s why I started cooking in the first place and probably why I’ll never stop. These projects are freeing for an overactive worrier like myself. My mind gets a break, and in the end, I usually have something delicious to show for it. I decided to try my hand at french macarons last weekend. I had a free day, no plans at all. After a pep talk from Jordan the day before, it was settled and the research commenced. I read lots of recipes, read horror stories of macarons gone awry, read encouraging posts assuring me that it wasn’t nearly as hard as everyone claimed. I’m happy to say, this will be one of those encouraging posts. It really is not as hard as you’d expect. 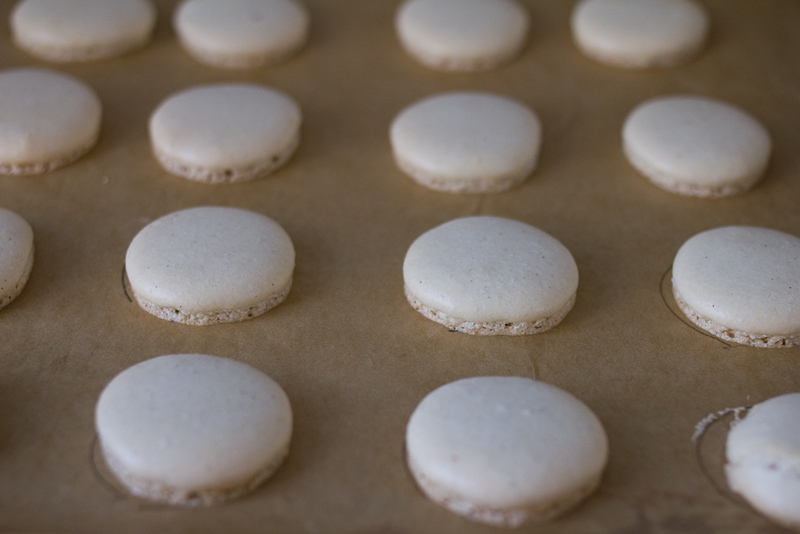 Yes, precision is necessary and some understanding of a few key techniques is helpful, but if you’re mindful, you can make perfect a french marcaron the first go round. The recipe I used is from a wonderful pastry blog Brave Tart. 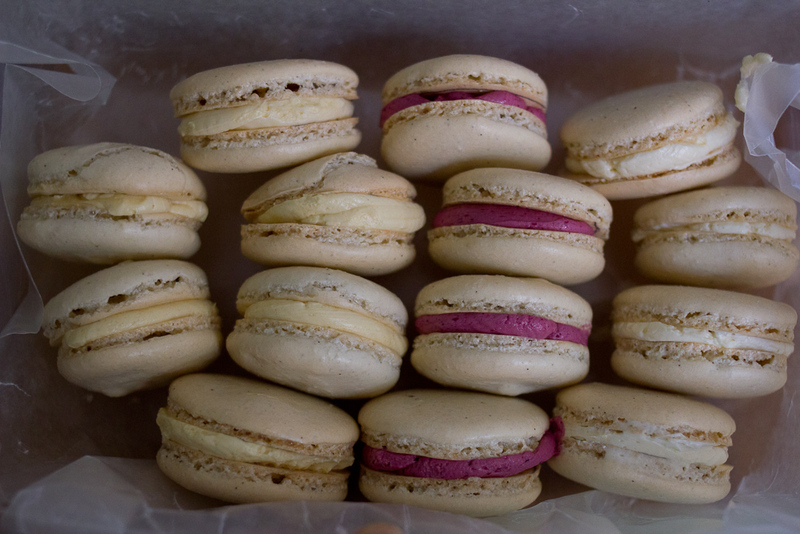 I’m positive her recipe and tips are the reason my macarons were a success the first time around. Thank you Stella! First, before we get into how to make the recipe, let’s talk about measuring the ingredients. Measurements by volume (cups, teaspoons, etc) are a bad idea for delicate pastry. Really, we all should always bake by weight and never volume because there can be such huge discrepancies between how each person measures one cup. There are also other intervening factors like humidity that can throw volume measurements off. 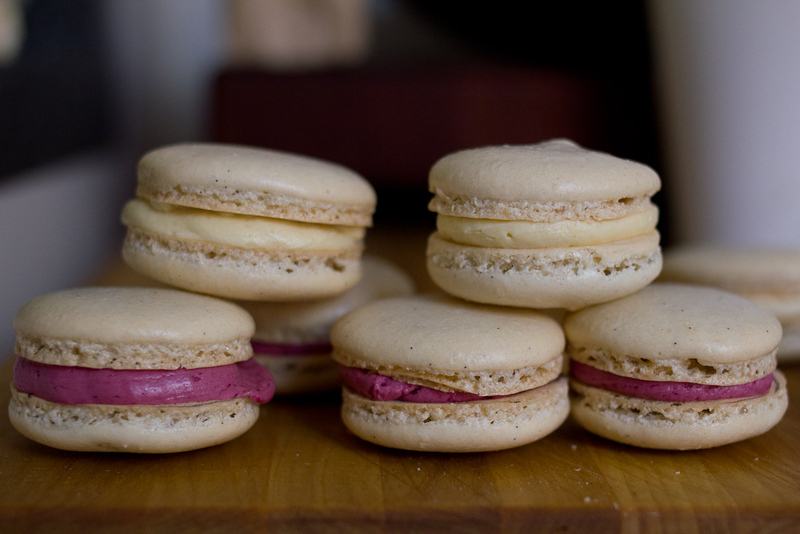 So save yourself some macaron grief, and get a kitchen scale. Measuring ingredients by weight is not only more accurate, but I’m sure you’ll find that it is actually faster and easier. Preheat your oven to 300 degrees. If you have an oven thermometer, put it in the oven to double check the temperature. If your oven is too hot, your cookies will cook unevenly or their shells will crack and crumble as they rise. Move both racks towards the center of your oven to ensure the cookies get the most even heat. See what I mean about precision? Not overwhelmingly difficult, but necessary. Line baking sheets with parchment paper. I traced 1.5″ circles on my parchment paper so that I would have something to trace when I piped the cookies onto the sheet. It’s important that the cookie shells are all about the same size because you sandwich two together. Insert a plain round tip into a pastry bag. 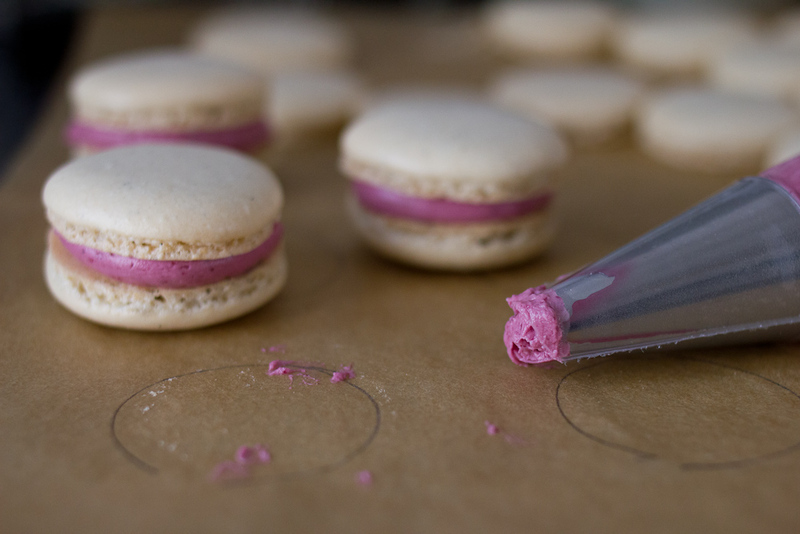 This is for piping the macarons onto the baking sheet. Here are some great tips on how to easily fill a pastry bag if the task seems daunting. Sift together the almond flour and powdered sugar into a medium bowl. You’ll have a spoonful or two of little almond granules that are larger than the rest and don’t sift through, just discard those. Separate your egg whites from the yolks. Put your yolks in the fridge and save them to make pastry cream for a raspberry napoleon. 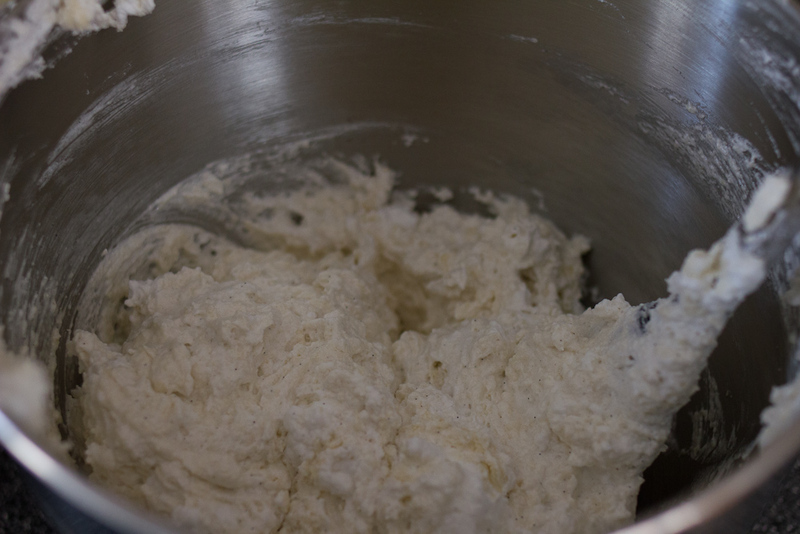 In the bowl of your mixer, combine egg whites, sugar, vanilla bean (not the extract if you’re using that) and salt. Mix on medium power (4 on a Kitchen Aid) for three minutes. Increase the speed to medium-high (7 on Kitchen Aid) and whip for another three minutes. Increase the speed to high (8 on Kitchen Aid) and whip for another three minutes. Turn the mixer off and add any extracts or colors here. Whip on high for another minute to incorporate. 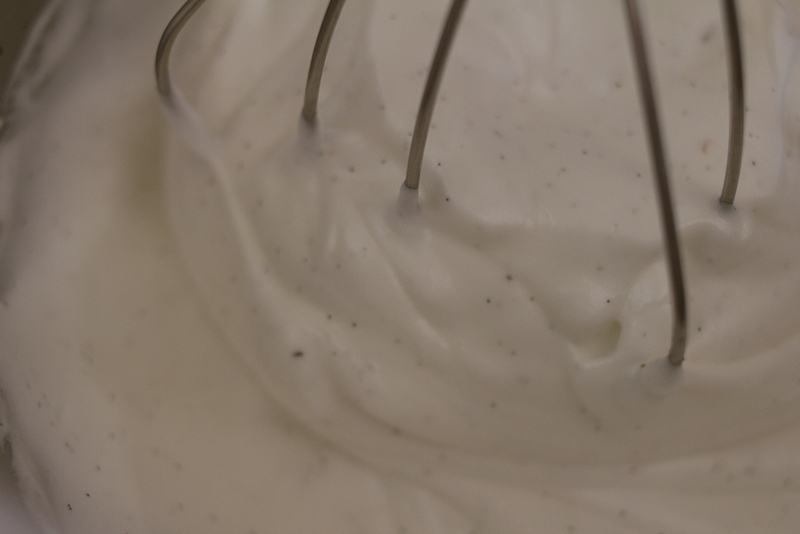 The mixture should look like a very stiff, dry meringue and should clump inside the whisk. If it isn’t very stiff, beat for another minute or two until it is. Aren’t the vanilla bean flecks just the cutest! Add the almond flour and powdered sugar to the meringue. 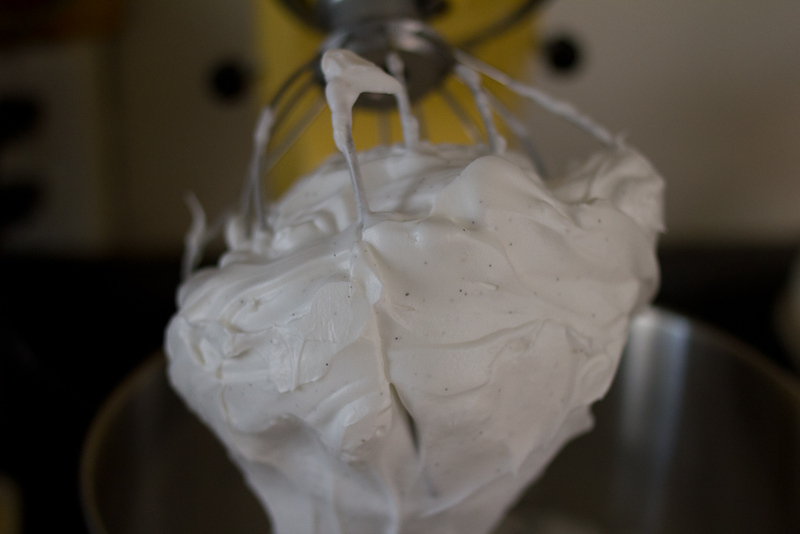 Using a large spatula, fold the dry ingredients into the meringue. It will take quite a while to fully incorporate. The purpose of this step is to deflate the meringue so don’t worry about knocking it around a little bit. Stella’s recipe was astoundingly accurate for me. She said it would take about 40 folds to incorporate the dry ingredients into the wet and get a good batter consistency and she was right. You want a batter that is thin enough to pipe, but not so thin it runs all over the baking sheet. She describes the texture as “molten” if that helps you. Mixing the ingredients thoroughly is important so be sure to scrape the sides the bowl several times while mixing. 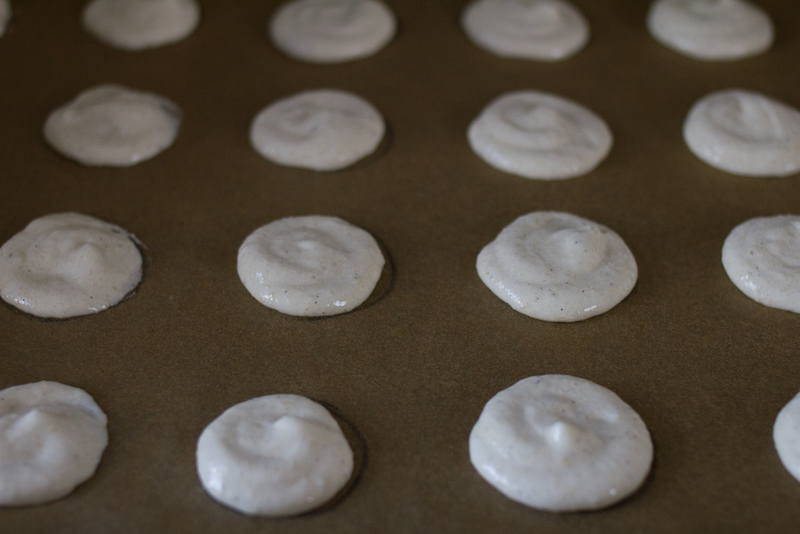 Streaks of unmixed meringue could also cause your cookies to crack in the oven. Once your batter is mixed, spoon it into a pastry bag. I’d recommend you only fill the bag about two-thirds full and then tie the top with a rubber band. Make the piping easier on yourself, don’t overstuff the bag! With a 10″ pastry bag, I only had to refill twice. Not bad. 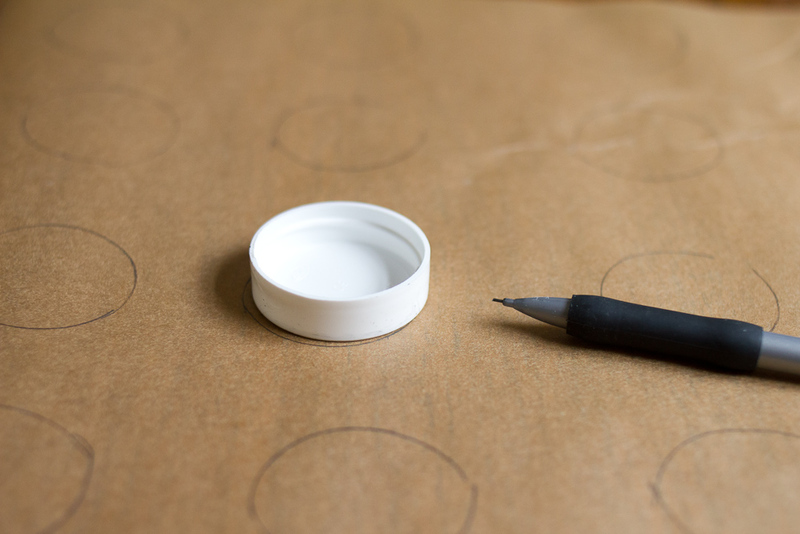 Pipe small circles onto your parchment lined baking sheet. Let the cookies sit for a few minutes on the counter to settle. Rap the trays hard on the counter several times. Don’t be shy about it. This removes the air bubbles that could also cause your shells to crack in the oven. I didn’t rap my first batch with quite enough vigor and most of my cookies came out with cracked shells. While cracked shells do nothing to harm the flavor, take this easy step to avoid them. For my second batch, I hit the tray hard against the counter about 10 times taking care to rotate it 90 degrees for a few of the raps and the shells came out perfectly. Bake the cookies at 300 degrees for 18 minutes. 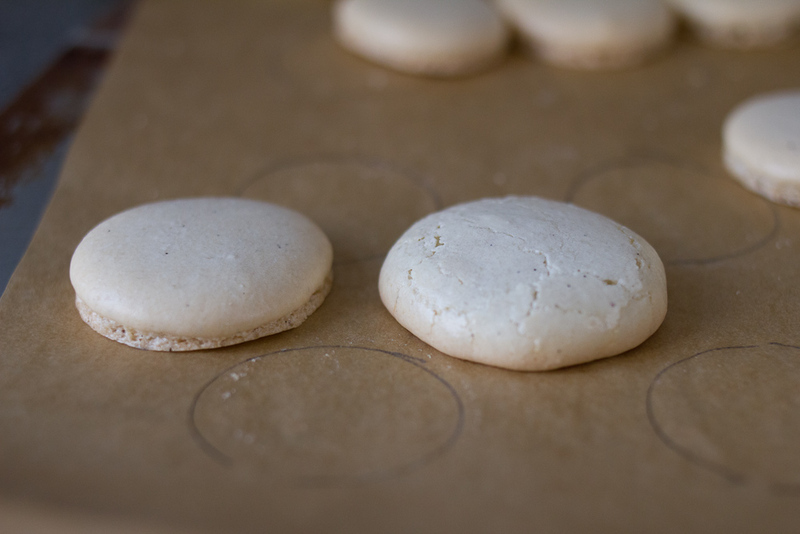 You should be able to peel the parchment away from the macaron without tearing out the center of the cookie. I’d test on a corner cookie before removing the sheet from the oven. Remove the cookies the oven and let them cool on the trays. Use a metal spatula to detach the cookies from the parchment after they are completely cooled. Below you can see the difference between a perfect shell and a cracked shell. The top of the cracked shell will sort of crumble and collapse when you fill it with cream, while the good shell will remain intact. Both are delicious though so don’t dispair if your shells crack! 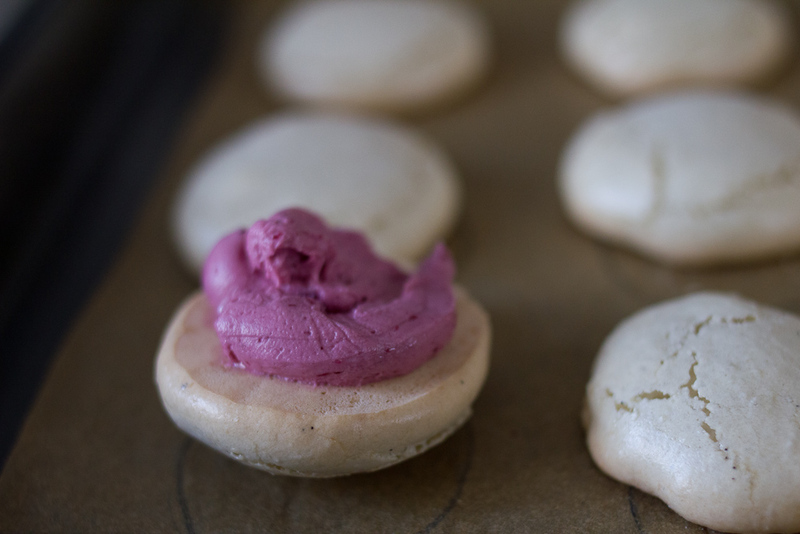 Once cooled, fill the macarons with the buttercream of your choice. I did vanilla, passionfruit and blackberry. All were divine! In a bowl over a pot of simmering water, combine the sugar and egg whites. Heat the egg and sugar mixture until you cannot feel the sugar granules when you rub the mixture between your fingers. 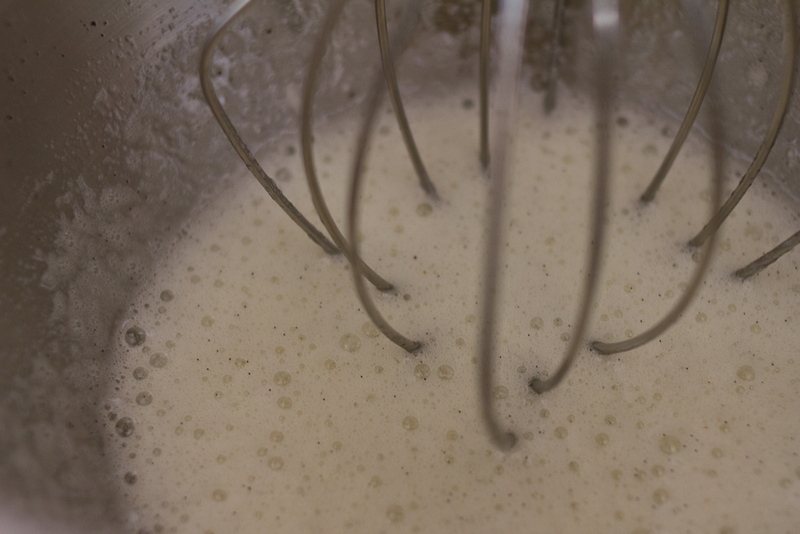 Transfer mixture into the mixer and whip until it turns white and about doubles in size. Add the vanilla. Finally, add the butter a few tablespoons at a time and whip, whip, whip. It will look like your buttercream is ruined for a few minutes. Don’t dispair! It will come together if you just keep whipping. 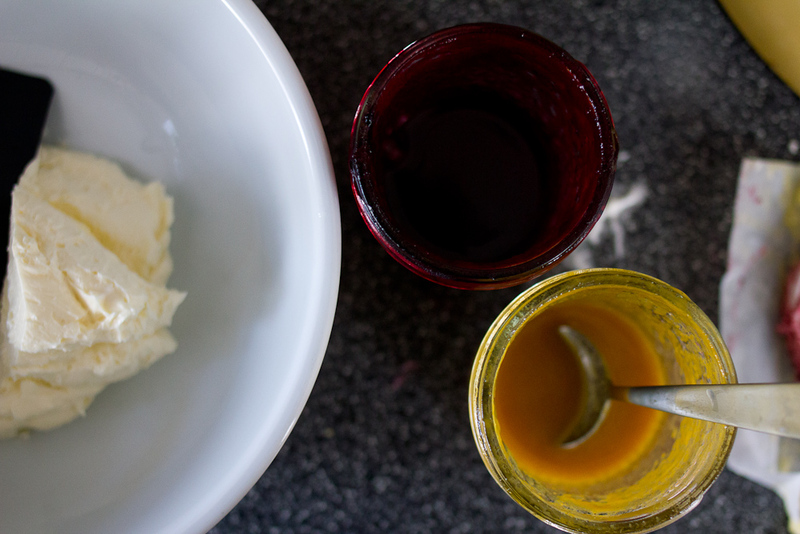 Once the buttercream is has been whipped into submission, put two thirds of it another bowl. To the remaining third, add the 3 tablespoons of blackberry syrup. Whip, whip, whip again until the syrup is incorporated. 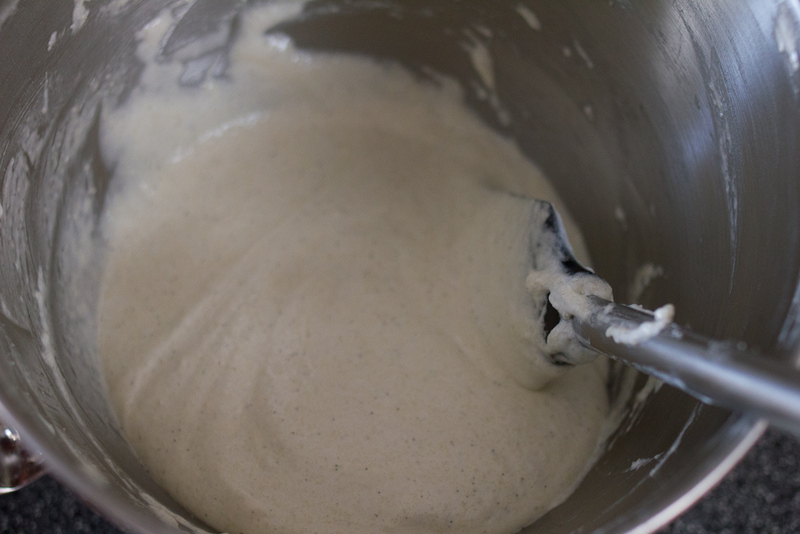 Remove that from the mixer, wash the bowl and whisk and then add another 1/3 of the frosting. Add 3 tablespoons of passionfruit syrup and whip whip whip! Put the filling in a disposable pastry bag with a round tip. Pipe about a teaspoon of filling onto the flat side of the macaron cookie. Sandwich the cream between another cookie. Continue with the rest of the cookies, alternating fillings if you’d like. The surprisingly truth about macarons? They only get more tasty as they age. While they are delicious the first day, they are insanely good on the second and third days once the cream and cookie have really melded together and become one. Store your cookies in a tupperware in the refrigerator, but let set them out for about an hour before serving to let the buttercream warm up a bit before you eat them. The texture is even more pleasant when you let them warm a bit. I am absolutely stoked with how these came out. They were delicious—sweet but not overwhelmingly so. Their texture was incredible—a crunchy exterior that shatters when you bite into it revealing a creamy, chewy interior. The passionfruit filling was positively addicting. Plus they are adorable. I’ll be making them again very soon. we’ve got a recipe index! and email subscription too! We’ve got a recipe index! 3 years of delicious recipes nice and organized for your viewing pleasure. If there is something you want to eat, but don’t find a recipe for it or if you want someone else to do the heavy lifting of perfecting a recipe, let us know! We’re always up to the challenge. If you want to search for a recipe or ingredient, click the little grey (+) at the top of the page and a search field will open up. But there is more! After 3 years, we’ve decided to migrate The Answer is Always Pork off of WordPress.com and onto our own server! More control, snazzy new blog design, no random wordpress ads. It’s great! But sadly, we’re not able to transfer our WordPress followers and email subscribers. If you’d like to get all of our new posts by email, please sign up here. Or click the subscribe link in the top menu. If you’d like to follow on WordPress like you did before, please do! Click the button that appears in the top toolbar of WordPress sites or bottom right corner of your browser window (when you’re logged in). Or now that Google Reader has met its untimely end, you can follow along on Bloglovin. Shall we talk some more about fish? Butterflied trout really are a perfect fish. Tender, mild meat, no pesky bones or guts to get in your way because the fishmonger took care of that for you, affordable and sustainably harvested. Plus, for something that cooks in about 10 minutes, they still manage to look quite impressive. I’m of the mind that whole fish are always impressive. You? And, now that July is here and summer is in full swing, it is time for everyone to get on this creamed corn. Originally from Thomas Keller’s Ad Hoc at Home, we’ve made a few tweaks so it pairs a bit better with the fish and eliminates some of TK’s meticulous technique. 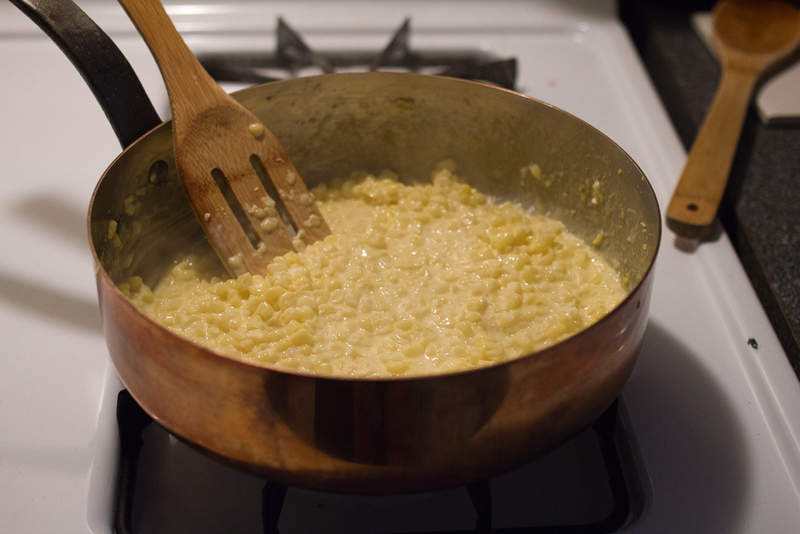 This creamed corn is good, really good. If you’ve only ever had creamed corn from a can, this is an entirely different world. One you want to live in. Forever. 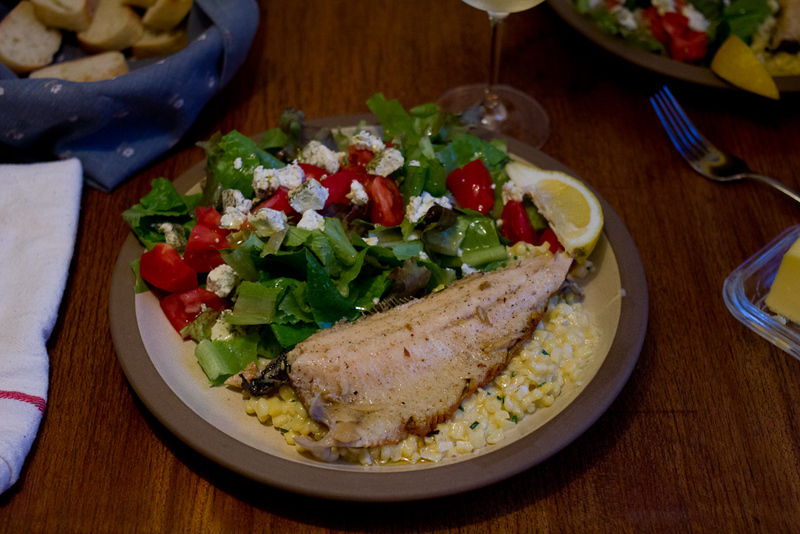 Now go get yourself some summer corn, a few fish and make this gorgeous dinner in 30 minutes. I’ve already done it twice. The recipe below serves four, so cut it in half if you’re cooking for two. 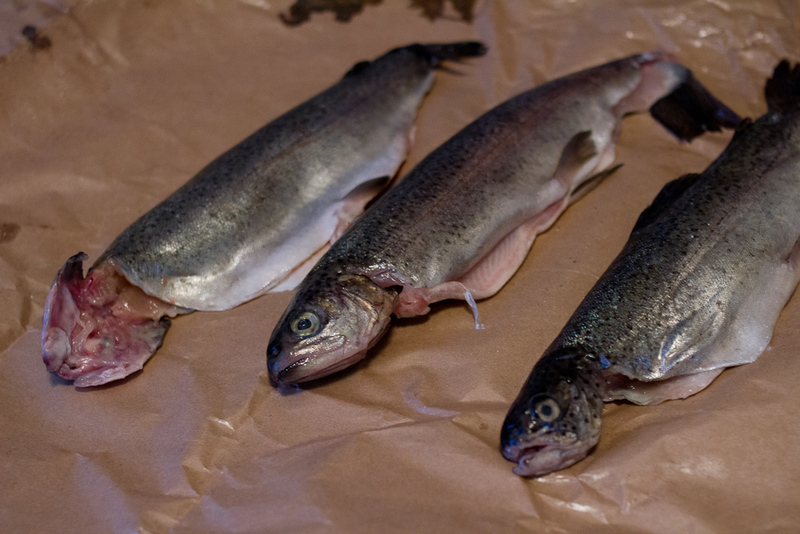 While the corn makes good leftovers, the same can’t really be said about the trout. Cut the corn off the cob. Scrape the cob with the back of a knife to get the rest of the corn flesh. 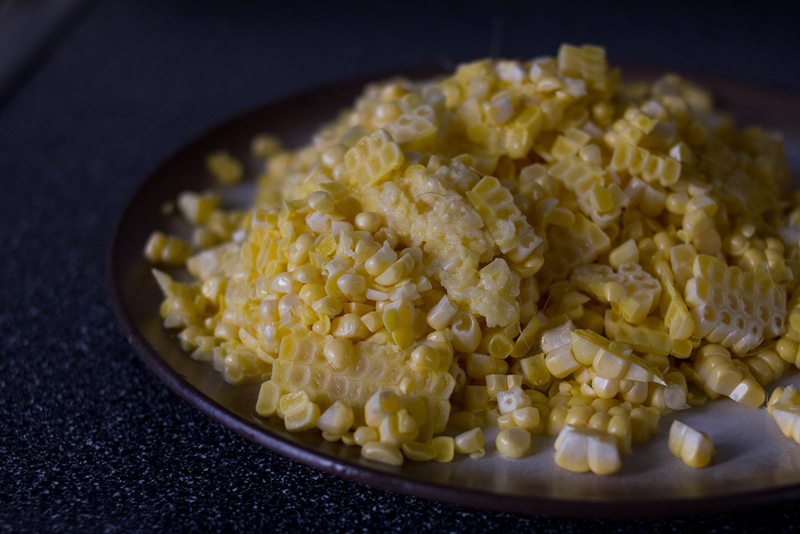 In a heavy saute pan over medium-low heat, combine the fresh corn, butter and lemon juice. Cook the corn for 5 – 7 minutes. Season with salt. Add the lemon zest and cayenne. Add the cream and cook for another 10 – 12 minutes, until the cream sauce has thickened. While the corn is cooking with the cream, cook the fish. Check for seasoning, add a little pepper and the chives. 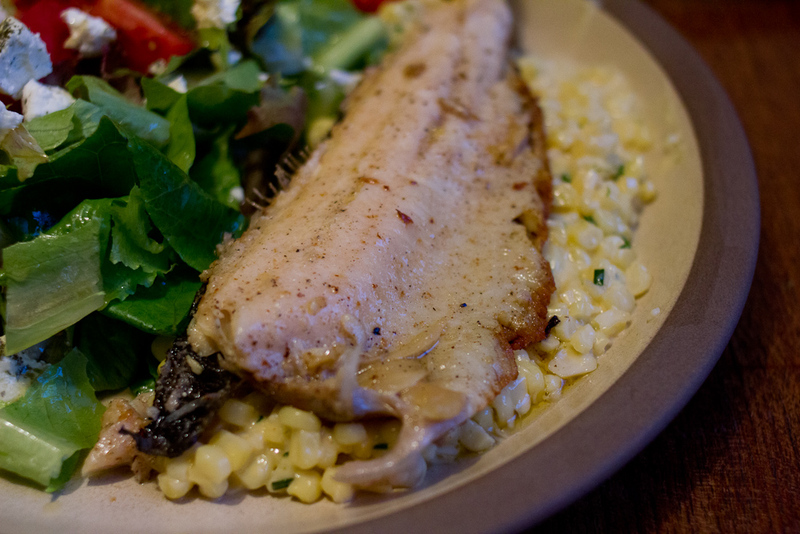 Serve fish with a bed of creamed corn underneath it. Season the inside and outside of the trout with salt. In a large saute pan, melt the butter and olive oil over medium heat. Add the garlic confit and smoosh the cloves a bit. 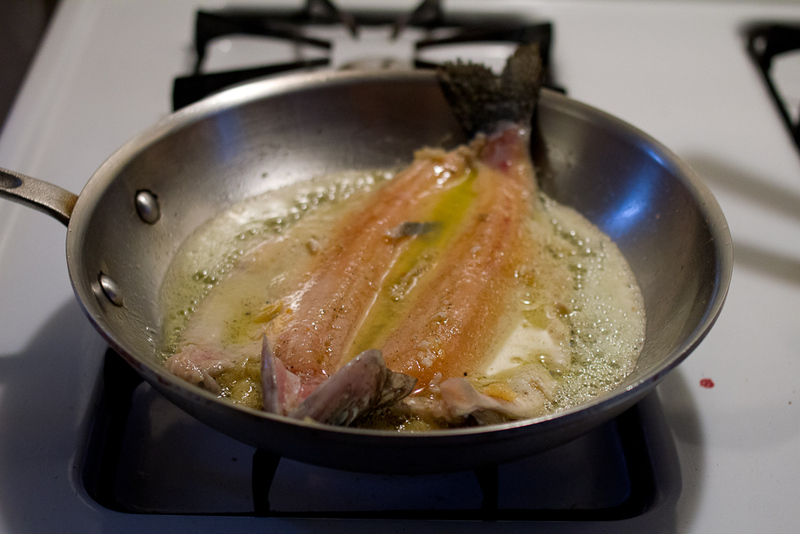 When the butter and oil mixture is hot, add the trout. Put it in the pan skin side down, spread flat. Cook for 7 – 10 minutes, basting the top occasionally with the butter. Because the fish is thin, you don’t need to flip it. This way the skin gets super crispy, but the fish doesn’t dry out. Just before serving, squeeze a lemon over the fish and add some freshly ground pepper. Serve on top of a bed of creamed corn with a salad or alternatively with roasted summer squash and potatoes anna.